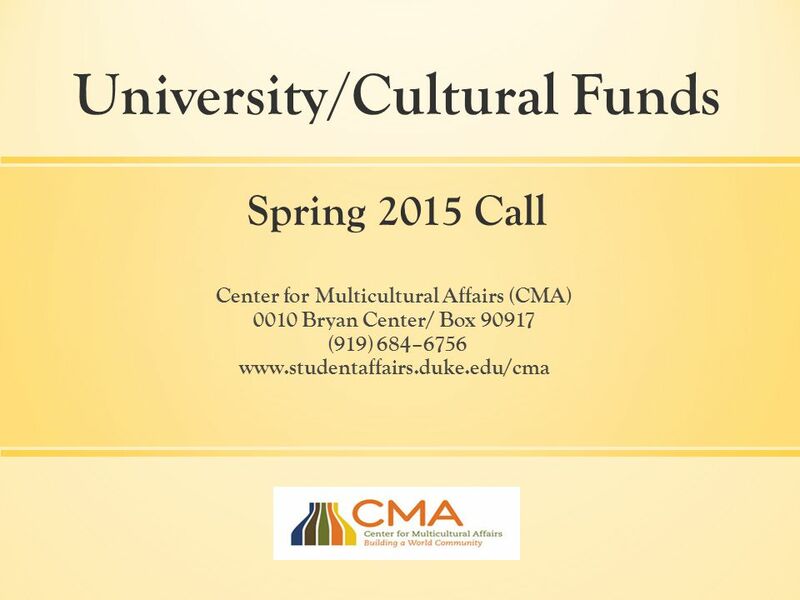 Center for Multicultural Affairs (CMA) 0010 Bryan Center/ Box 90917 (919) 684–6756 www.studentaffairs.duke.edu/cma University/Cultural Funds Spring 2015. 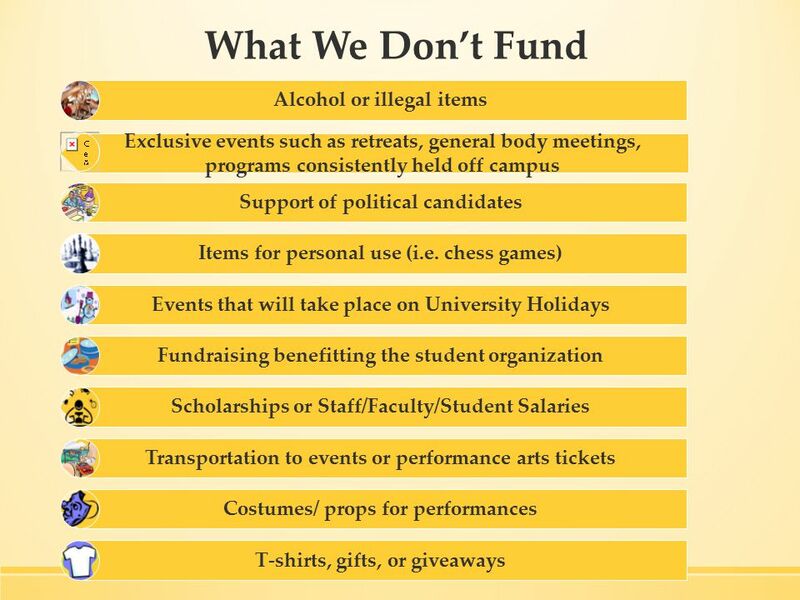 2 What is the University/Cultural (U/C) Fund? 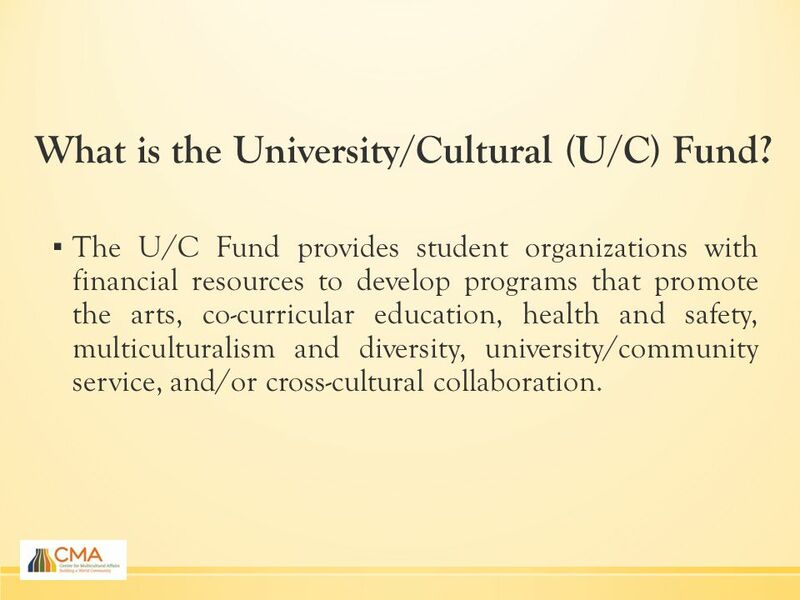 ▪ The U/C Fund provides student organizations with financial resources to develop programs that promote the arts, co-curricular education, health and safety, multiculturalism and diversity, university/community service, and/or cross-cultural collaboration. 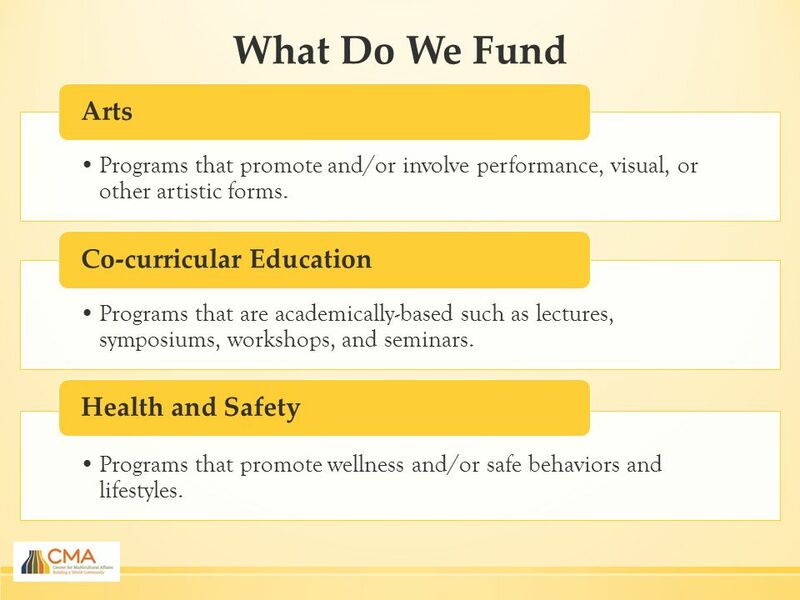 4 U/C Fund ▪ The funds allocates $116,000 each semester, for a total of $232,000 a year. 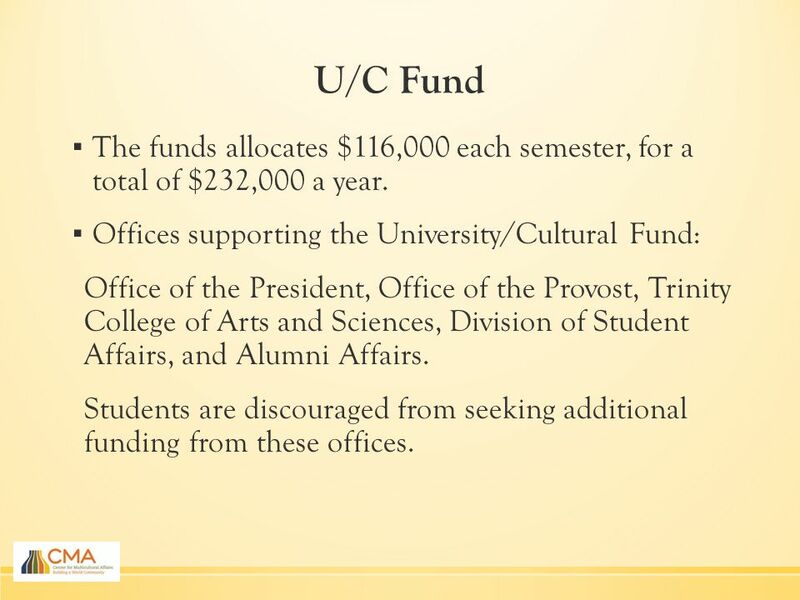 ▪ Offices supporting the University/Cultural Fund: Office of the President, Office of the Provost, Trinity College of Arts and Sciences, Division of Student Affairs, and Alumni Affairs. 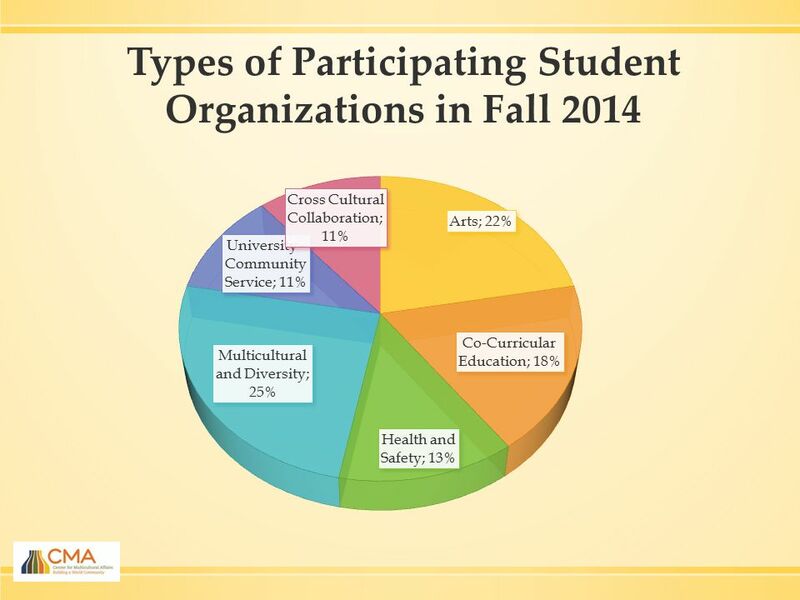 Students are discouraged from seeking additional funding from these offices. 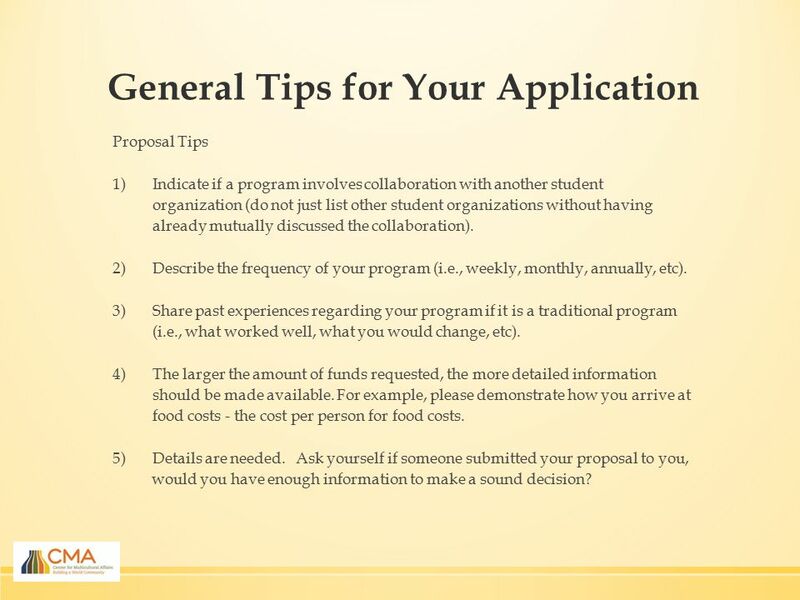 12 General Tips for Your Application Proposal Tips 1)Indicate if a program involves collaboration with another student organization (do not just list other student organizations without having already mutually discussed the collaboration). 2)Describe the frequency of your program (i.e., weekly, monthly, annually, etc). 3)Share past experiences regarding your program if it is a traditional program (i.e., what worked well, what you would change, etc). 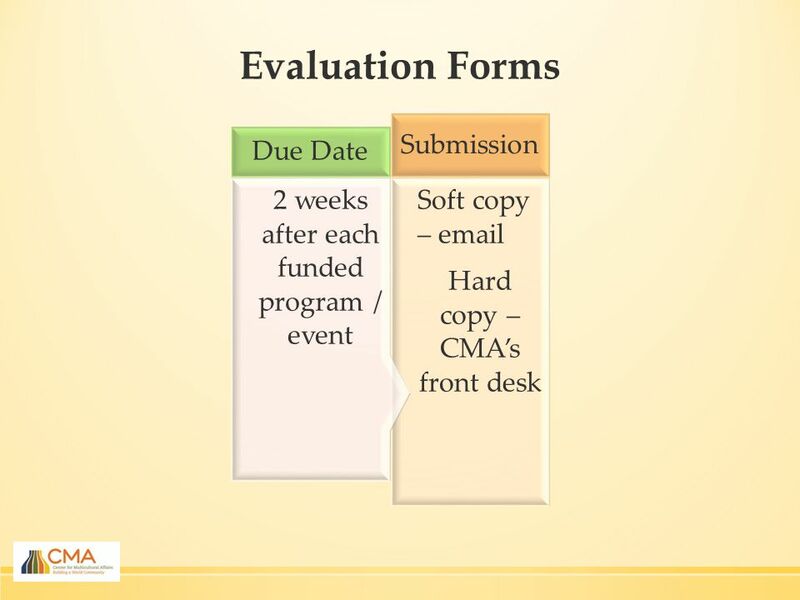 4)The larger the amount of funds requested, the more detailed information should be made available. For example, please demonstrate how you arrive at food costs - the cost per person for food costs. 5)Details are needed. 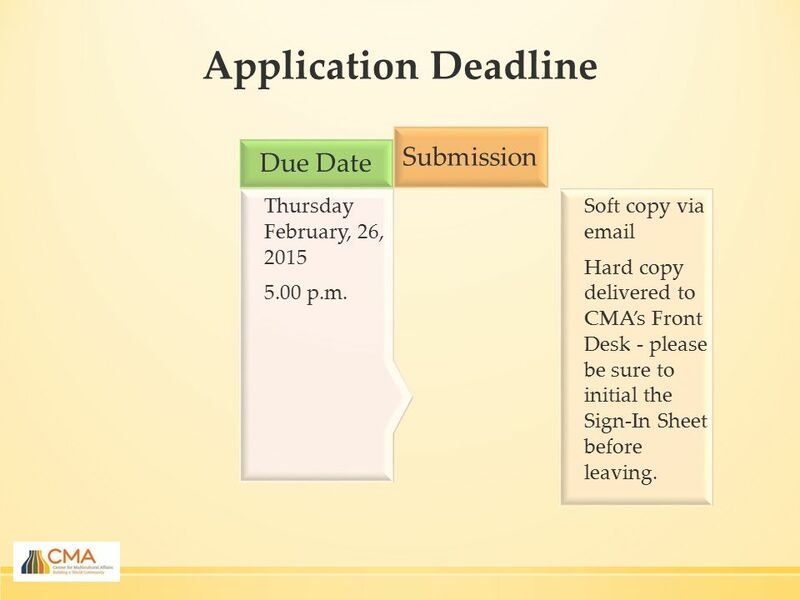 Ask yourself if someone submitted your proposal to you, would you have enough information to make a sound decision? 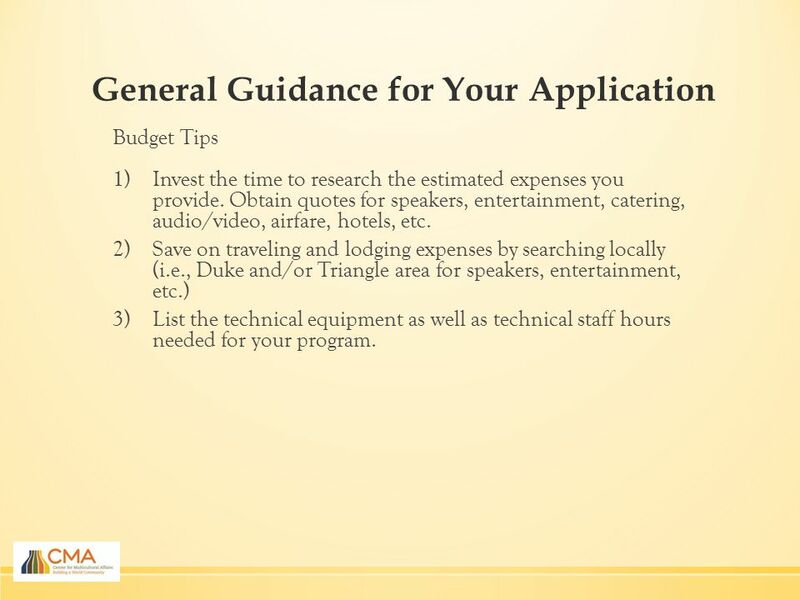 13 General Guidance for Your Application Budget Tips 1)Invest the time to research the estimated expenses you provide. Obtain quotes for speakers, entertainment, catering, audio/video, airfare, hotels, etc. 2)Save on traveling and lodging expenses by searching locally (i.e., Duke and/or Triangle area for speakers, entertainment, etc.) 3)List the technical equipment as well as technical staff hours needed for your program. 16 Questions? 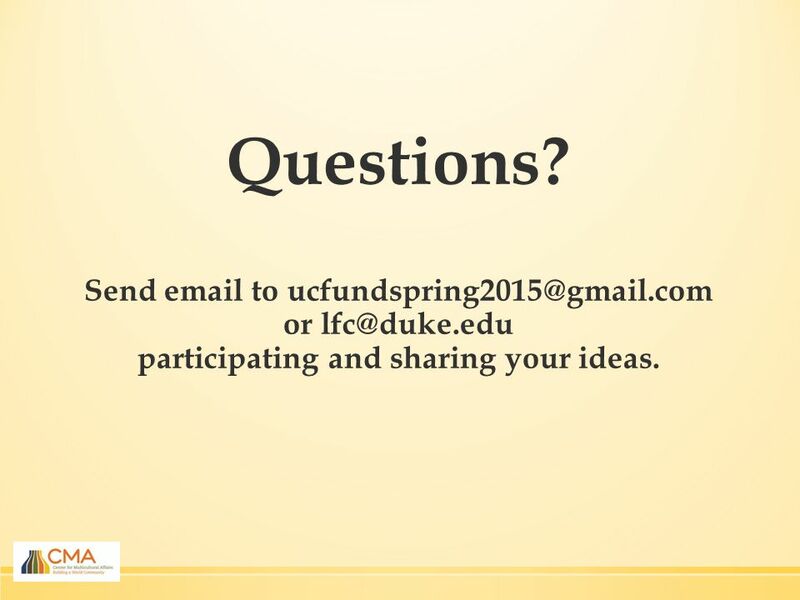 Send email to ucfundspring2015@gmail.com or lfc@duke.edu participating and sharing your ideas. 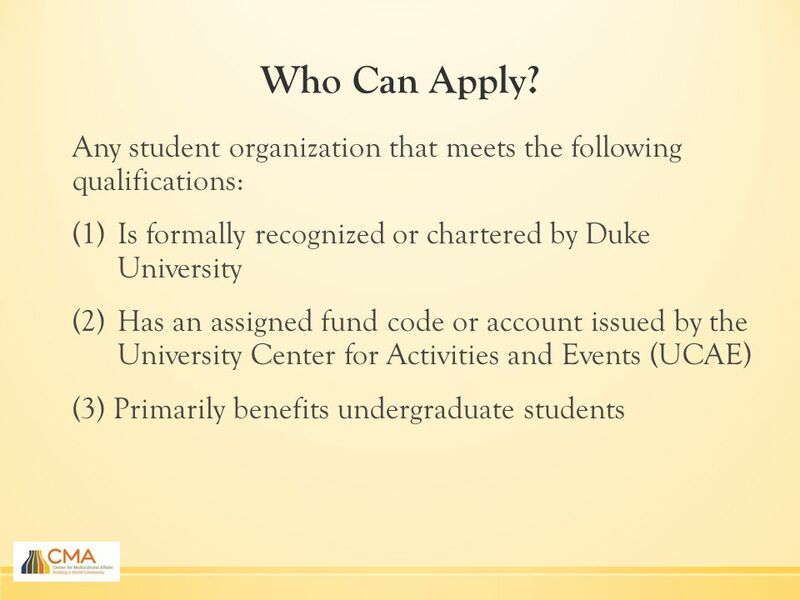 Download ppt "Center for Multicultural Affairs (CMA) 0010 Bryan Center/ Box 90917 (919) 684–6756 www.studentaffairs.duke.edu/cma University/Cultural Funds Spring 2015." Presented By: Ryan Anderson - OSA Student Organization Coordinator Vanessa Rodriguez. EXCITING NEW OPPORTUNITIES Strategic Innovation Fund Global Water Center Innovation Campus. Overview of Leading a Trip Purpose. Outreach. Adventure. Wartburg Service Trips. 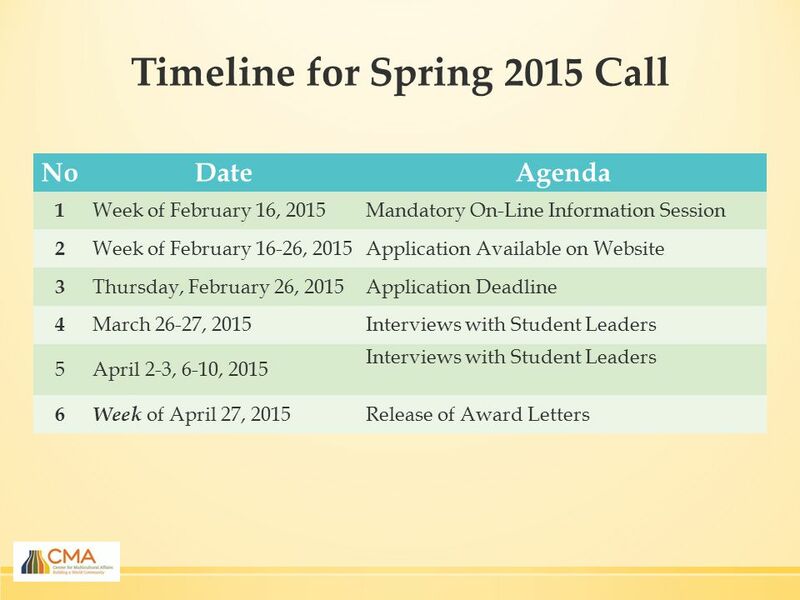 STUDENT ORGANIZATION TRAINING FINANCE MODULE 4 – PERSONAL SERVICES AGREEMENTS Effective January, 2015. Impact 100 Women Together, Changing Lives. COMMON GRANT TRAINING. 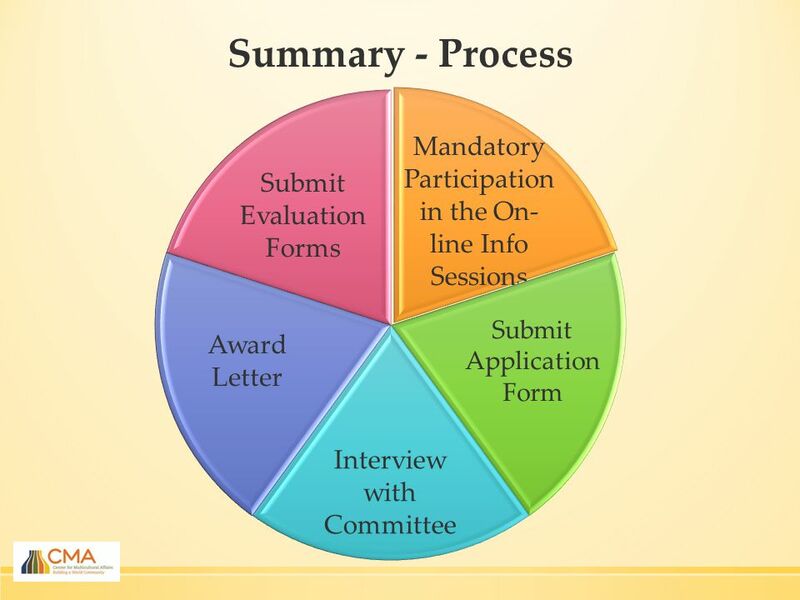 Fellowship costing and application process: an overview Deborah McClean Research Office. Welcome! William Mitchell College of Law Student Bar Association Clubs and Orgs Meeting. GSG Grants Workshop August 29,  GSG grants fund graduate students’ research and professional development  Graduate students in all disciplines. URECA ! Undergrad Research Experience and Creative Activity. SGA Funding 101 Session Presented by: Sandra Rojas Vice President of Business & Finance. StudOrgs Finance Workshop. Check Request for Vendor  Agenda of the StudOrg meeting indicating discussion or expenditure  Approved minutes of the StudOrg.